A new inclusive career pipeline is underway for students at Saint Mary’s College of California. 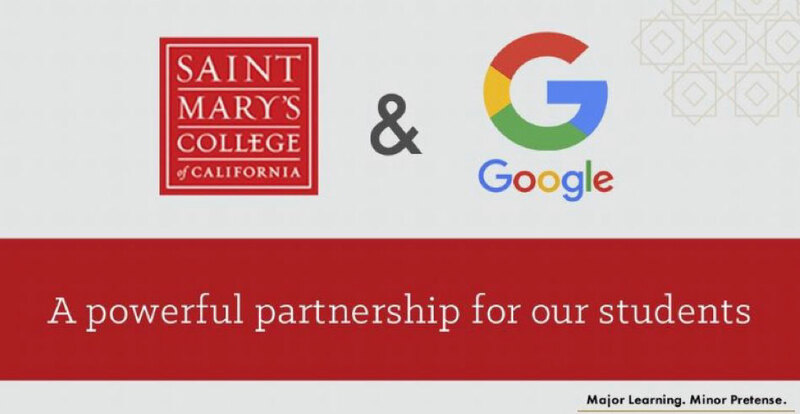 As the result of an exciting new partnership, Saint Mary’s has officially been recognized as a recruiting college for Google. Through the partnership, Saint Mary’s students will be eligible to attend coding boot camps and participate in internships and other special educational programs. Importantly, there will also be more targeted outreach to Saint Mary's students for jobs at Google. Facilitated through Google’s University Programs, which recently fostered an inclusion partnership with Howard University, a noted historically black college, Google’s connection with Saint Mary’s, builds on the College’s strategic efforts as a Hispanic-Serving Institution (HSI) to expand STEM (science, technology, engineering, and math) resources for the College’s Hispanic and low-income students. Those resources include a new STEM center, expanded tutoring, mentoring and professional development and outreach training for faculty. Last summer, Computer Science Professor Nada Attar and Business Analytics Professor Navid Sabbaghi, two of the College’s leading professors of data science, attended a three-day Google Faculty Summit in Los Angeles for Hispanic-Serving Institutions. “Saint Mary’s is an ideal partner for Google," said Amy Vernetti, Director of Leadership Recruiting for Moonshots and Bets at Alphabet, Google's parent company. "A diverse student body, a growing reputation in data and computer science, and a 150 year old liberal arts tradition is a great combination for us," added Vernetti, who is an alumna of Saint Mary’s and serves on the advisory board of the College’s School of Economics And Business Administration.